Comet Lovejoy emerged from behind the sun, as seen by the tail and head marked in this SOHO image on Dec. 16, 2011. A newfound comet that plunged through the sun's atmosphere Thursday (Dec. 15) — and amazingly survived — was visibly maimed by the encounter, which left the icy wanderer without its long, bright tail, a scientist says. According to Karl Battams, a solar researcher at the U.S. Naval Research Center in Washington, the death-defying comet Lovejoy slipped through the sun's outer atmosphere (called the corona) with a bright tail in tow, only to reappear tailless on the other side. The comet zoomed within 87,000 miles (140,000 kilometers) of the sun's surface, making its closest approach at about 7 p.m. EST Thursday (midnight GMT on Dec. 16). Instruments called coronographs aboard several sun-watching space observatories caught the unexpected solar sight. 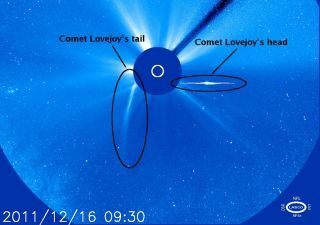 A labeled photo of comet Lovejoy and the sun after their encounter posted by Battams clearly shows a tail-like feature on one side of the sun and the head of the comet on the other. The tail may be older dust and gas ejected by comet Lovejoy before it entered the sun's corona that is still traveling on the same trajectory, Battams wrote. But while comet Lovejoy may be mutilated by its sun encounter, comet fans shouldn't worry too much. "I'm pretty confident that we will see Comet Lovejoy grow a new one," Battams wrote. Comet tails are created when their icy surfaces warm up, creating a gas that gets blown outward by the sun's solar wind. Charged particles from the sun can also turn some of a comet's gases into charged ions to form an ion tail. Comet tails always point away from the sun. The unexpected survival of comet Lovejoy has amazed Battams and other astronomers because most comets that have close encounters with the sun are destroyed. In fact, many researchers predicted the comet would likely fizzle out, as the chances of its survival were so low. "What an extraordinary 24hrs!" Battams wrote. "I was wrong. Wrong, wrong, wrong. And I have never been so happy to be wrong!" Comet Lovejoy hurtled towards the sun on December 15, 2011, as seen by the SOHO spacecraft. Australian amateur astronomer Terry Lovejoy, who discovered the comet on Nov. 27, told SPACE.com that the attention his find has received has been amazing, and that he was happy to make a contribution to astronomy. "It's been tremendous," Lovejoy told SPACE.com just hours before the comet's swing through the sun. "Apparently it's all over Facebook, and I don't use Facebook. But there's a lot of interest. I think a lot of people like the name — the Lovejoy name seems to strike a chord with people." SPACE.com assistant managing editor Clara Moskowitz (@ClaraMoskowitz) contributed to this story. You can follow SPACE.com Managing Editor Tariq Malik on Twitter @tariqjmalik. Follow SPACE.com for the latest in space science and exploration news on Twitter @Spacedotcom and on Facebook.